Update 4: 20 Endorsement! Very, very nice! Update 3: 10 Endorsements! Thank you all very much. Update 2: Mount.dlc modified to ensure wider compatibility with other fan DLC. Update 1: Wohoo! My first endorsement! It gives me "back" the single thing i loved (and missed) in Andromeda, my Auto Valk' AR. Thank you for commenting - am glad you enjoyed the auto-valkyrie. 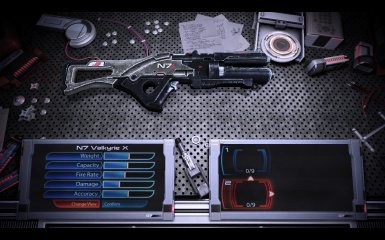 For what its worth, I too share your sentiment that the automatic version reflects a true N7 rifle - a sleek, powerful rifle that demand precision in return. Now if only there was a way to be able to switch from semi-auto to fully automatic and back again in game. xP Looks like a great mod, I look forward to trying it! Is there any reason this does not work on Squadmates? Is there a way to get it to work for them? The way the game handles 'squaddies' (referred to as 'henchmen' is that they're assigned 'rounds-fired per burst' in the coalesced file. Whilst very easy to mod, coalesced modifications are difficult to distribute without wiping out everyone else's modifications. Just go to the coalesced file (located in the CookedPC folder) and modify the coalesced file. There is a veritable array of guides and tools, out there, for your convenience. Apologies for the late response. But thanks to the kind folks at me3explorer proboards, its now very possible to create and distribute coalesced mods for general use (without impeding on other users mods). As a result, there is now a version of the Automatic Valkyrie with a larger magazine size (30 rounds, to match standard mag sizes) and improved squad handling. To truly appreciate its improved utility, I recommend trying it out with the Mass Horizons Mod. Team: Brrrrapp! Brrap! Brrap! Brrap! Team: Brrrrappp! Brrap! Brrap! Brrap! Brrap! Brrap! Shepard: Okay guys cut the crap. Save me some. THANK YOU!! It's about time squadmates had a REAL assault rifle to use besides the same two and sub-optimal ramp up ARs. I already use MH Respawn. I tore through it even before this upgrade. The game still suffers imbalances for SMs (e.g. weak pistol and SMG options, improperly using charged weapons, etc). This mod renews my hope that I can correct the areas that never got love: beefing up shields, speed, and damage on combat pets (drone, quarian and geth turrets, defense drone), returning grenades to ME2 functionality (for SMs), placement of decoy (SMs), and upgrading some of the SMGs and pistols and tweaking their casting time. This should be fun... once I get past the learning curve. Bless you, kind Sir/Ma'am. I have to ask, is there any chance of getting a version with a larger mag? I don't mind, but with 16 shots, I'm reloading just before a kill every time. Even a boost up to just 20 would be helpful. Either way, this is an amazing mod, and I thank you for making it. Endorsed, obviously. Thank you for the compliment and the upvote. Unfortunately, at this time, a mag-size modification would require a coalesced modification (something easy to do, but difficult to distribute without screwing up everyone else files). Ah, thank you for the quick response. I'll give the extended mag a shot, I forgot that was a weapon mod, and if that's not enough I'll do the editing. Thank you! No problem! Am glad that you like it! Can you tell me how you made the weapon fully automatic? 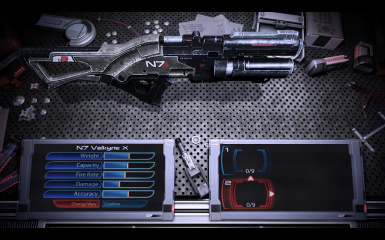 I'm trying to edit other weapons using ME3 Explorer but there's so many things. There's an enum fire type in the weapon file... One of the property pages, I think Default__SFXWeapon_NameOfGun. It would seem that the images are broken so I couldn't really understand what was going on. All I know is you have to mess with the pcc file. ANy pointers would be nice. Just "add" a new name called "FireMode_FullAuto" and replace "FireMode_Burst" with it. However, I've noticed the muzzle flash appears from midway through the barrel, rather than the tip. It would make my life easier if you link or send a screenshot of it. I am currently away from my rig, so the earliest I will be able to provide you with an image is after new years. Rest assured, I will get the screen to you. It seems the problem no longer persists, and was only briefly present on the Normandy shooting range added with EGM. Ah, I see then. Glad to see that it has been resolved. Thank you for endorsement and comment. Happy hunting! Can you increase the magazine and spare ammo capacity? No. That is handled by the Coalesced file (out of context for this mod - I simply focus on making it an automatic weapon). I would happily create a 'coalesced' mod, but right now that is not possible. This doesn't affect MP because your mount.dlc loading flag 0x8 doesn't load the mod in MP, not because there is any sort of lock. I deliberately chose a mount.dlc file that avoided conflict with the MP loading. I didn't want to risk the ire of the EA Banhammer.